Total Digest is a digestive enzyme and probiotic formula developed to help with your pet’s digestion and nutrient absorption. The enzymes in Total Digest help break down more of the ingredients and fillers in pet food, providing pets with more nutrients, which will help promote their energy levels, support their immune systems, and maintain their overall health. This formula will also help pets with occasional digestive upset, loose stools, bloating, and gas. Nutritional deficiencies aren’t fun for any dog or cat. When a dog or cat is lacking certain enzymes and nutrients, they can have bad breath, loose and/or foul-smelling stool, gas, bloating, excessive shedding, weight concerns, and more. That’s exactly where Total Digest from Thomas Labs comes in. 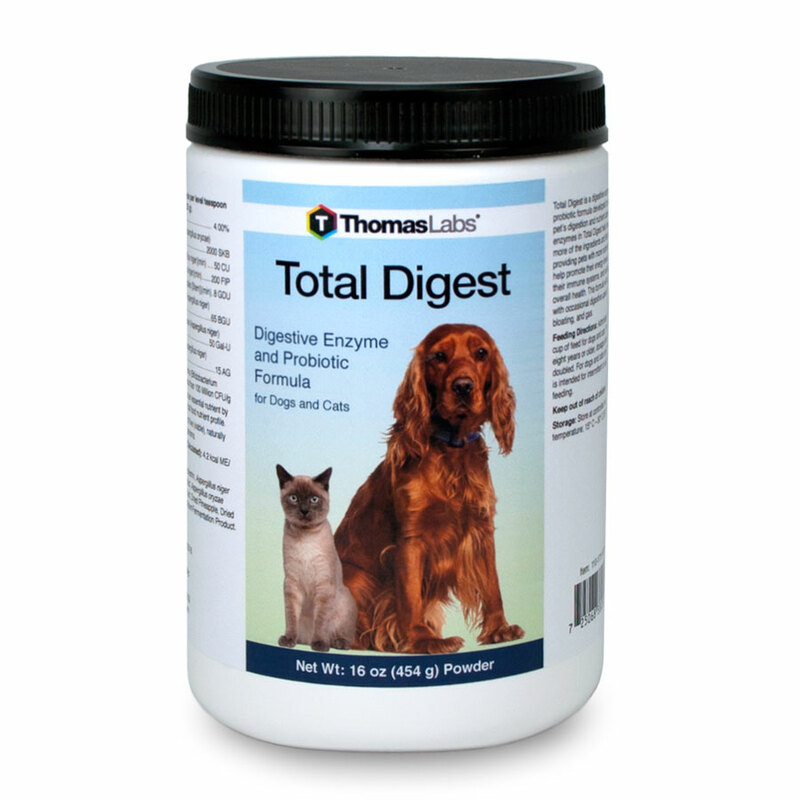 Total Digest is a digestive enzyme and probiotic formula that contains essential enzymes to support a dog or cat’s digestion, nutrient absorption, and better overall health. By utilizing the full potential of nutrients found in food, this formula can support a pet’s skin and coat, immune system, energy level, and ability to maintain a proper weight. Because digestive enzymes are so important for your pet’s overall health, we recommend the addition of digestive enzymes that will allow your pet to process food and absorb the nutrients he needs to thrive! Total Digest also contains beneficial probiotics for dogs and cats. Pet probiotics help restore the natural balance of good bacteria in the digestive tract, which may help with digestive upset, occasional loose stool, gas, bloating, and even help animals with food-related allergies. Administer 1 scoop per cup of feed for dogs and cats. For animals eight years or older, dosage should be doubled. For dogs and cats only. This product is intended for intermittent or supplemental feeding.